Laurie and I couldn’t secure permits for this loop when we arrived at the Grand Teton National Park visitor center 3 days ago. But the way the permit system works, we were able to add this loop to our existing itinerary. 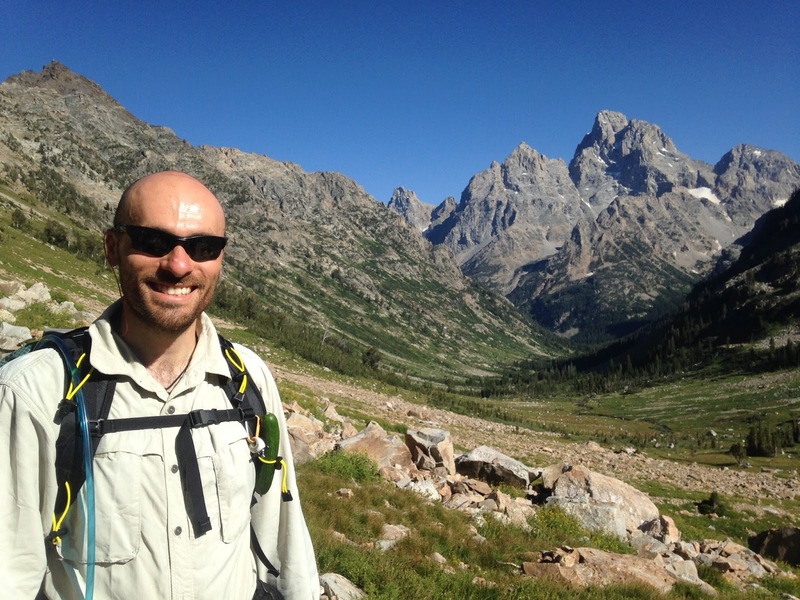 Having completed a three day, two night loop from of Death Canyon via Alaska Basin and Death Canyon shelf, we set out to hike through Cascade Canyon from the String Lake Parking lot. 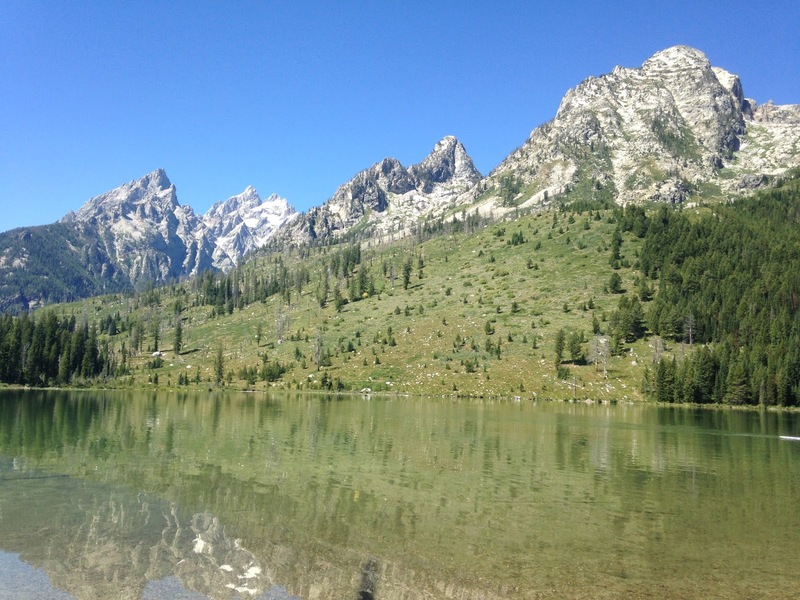 We chose String Lake for two reasons: Jenny Lake trailhead was full by the time we got there, and it meant a shorter hike the following day. It also meant a longer hike today. But no matter. Having already hiked 5 miles, we were warmed up and ready to go! The day was hot. We started hiking around 11:30am and found ourselves overwhelmed by the crowds. 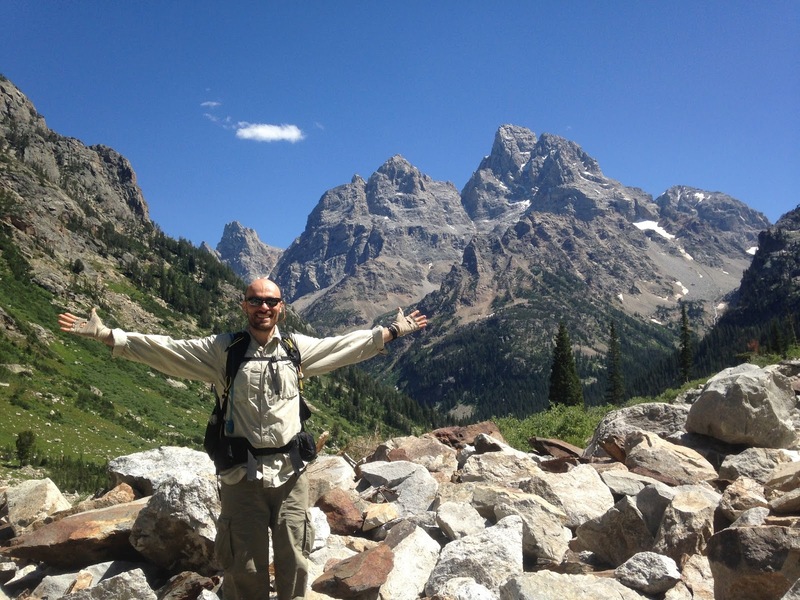 Day hiking from Jenny Lake to Inspiration Point is a popular day hike. It’s not easy as the trail goes uphill from the first step. The steep trail, coupled with the heat and amount of people on the trail caused many bottlenecks. 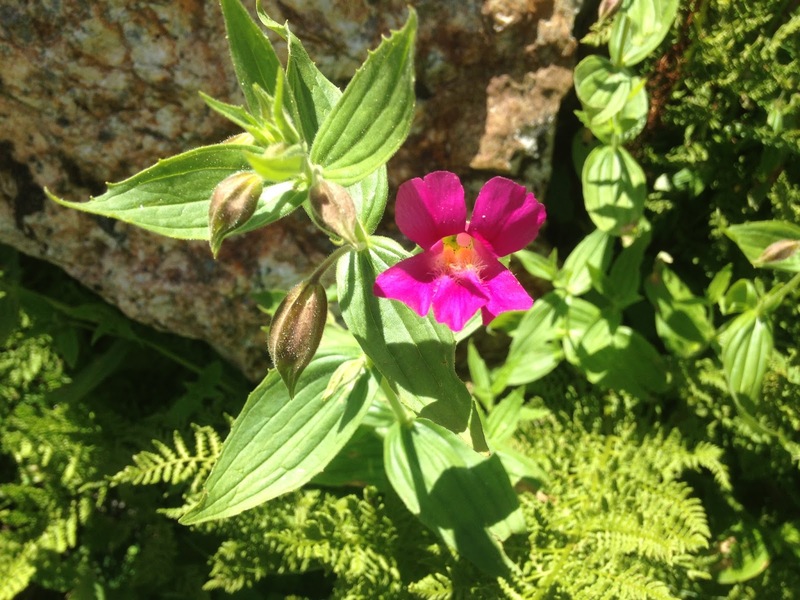 We constantly reminded ourselves to breathe and enjoy being in the mountains. We couldn’t do anything about the number of people on the trail. 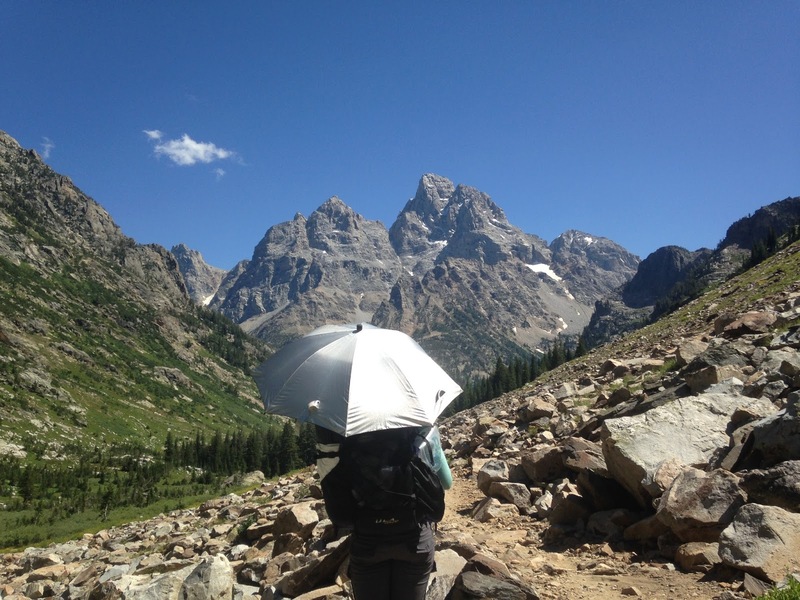 We were in the Tetons during the busiest week of the season – after the snow has melted and before kids go back to school. Deep down we knew we could hike the 12.6 miles (with roughly 4,000ft of elevation gain) to camp, we simply needed to remind ourselves of this from time to time. 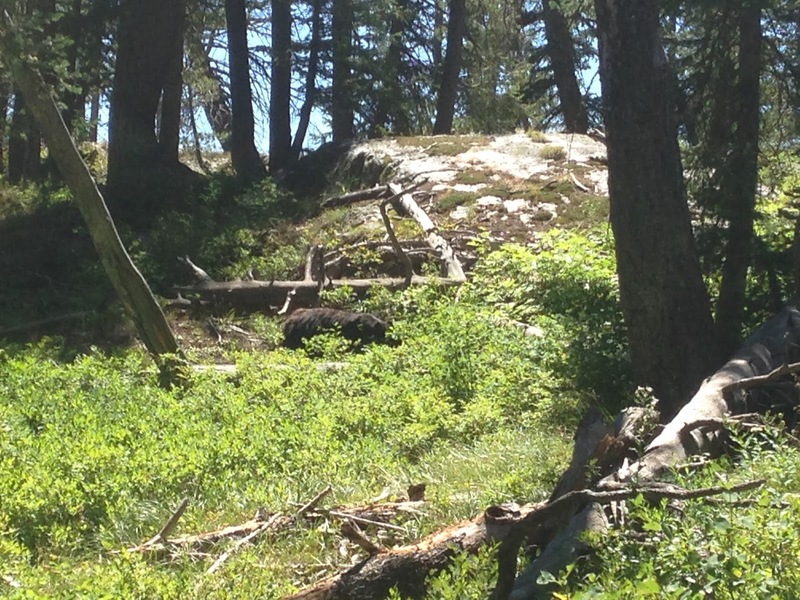 We had no intention of going to Inspiration Point, but we received word from other hikers of a black mama bear and her two cubs very close to the trail, so we followed the masses hoping to catch a glimpse. We vaguely saw the cubs in the distance as they climbed trees and foraged. But as the sow came closer and closer to the trail, Laurie and I turned around. 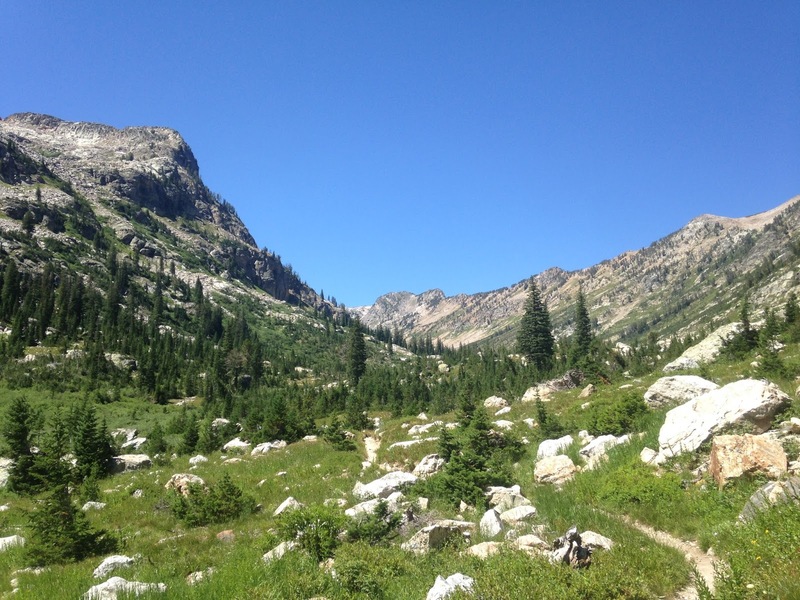 Once on the Cascade Canyon trail, the crowds thinned tremendously. The trail was exposed and hot, but the views opened up with every step. Shortly after we were back under the shade of trees until the South Fork Cascade Junction. We veered right and kept climbing. Soon after we were out of the trees once more. As we climbed higher, the canyon opened up and the views were breathtaking. 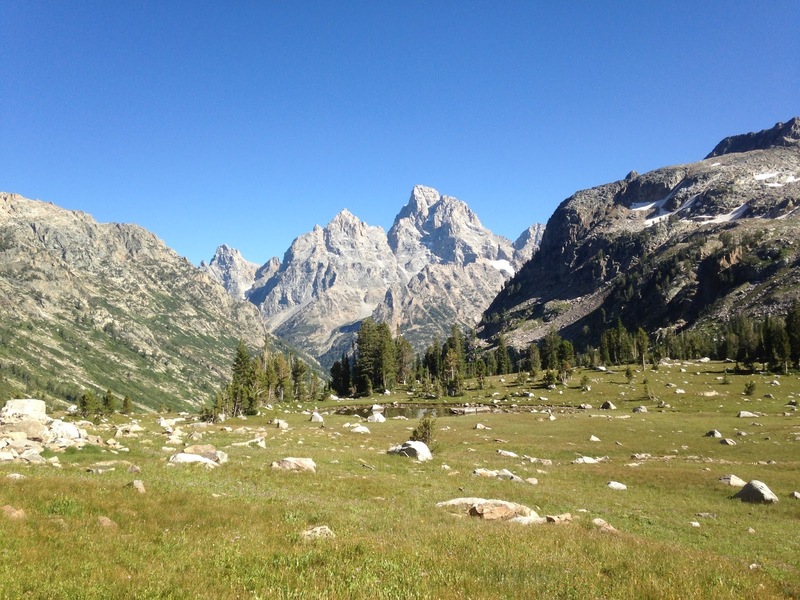 The Tetons towered behind us as we gradually gained elevation. We couldn’t help but stop many, many times for photos. 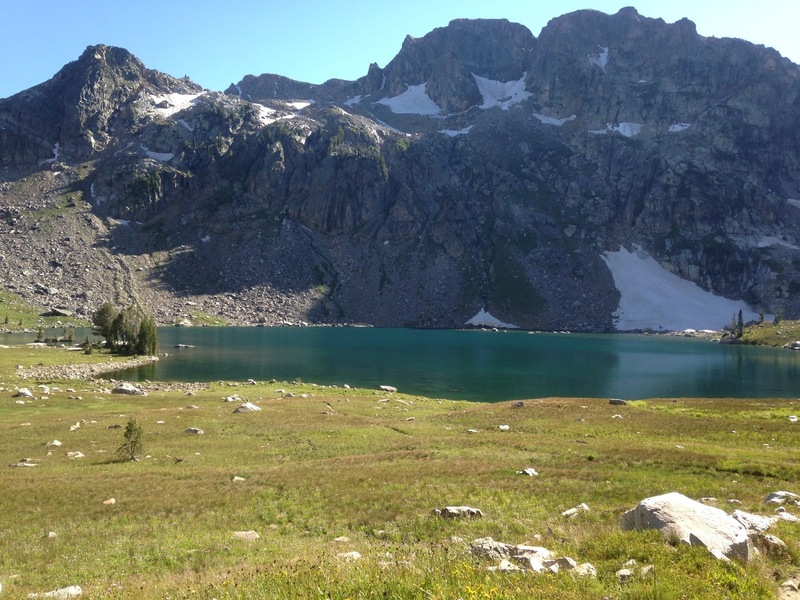 The reward for the long climb through Cascade Canyon is Lake Solitude – a wonderful treat situated in a glacial basin. Camping is not allowed here but it is a great place for a rest and a soak before the long climb to Paintbrush Divide. 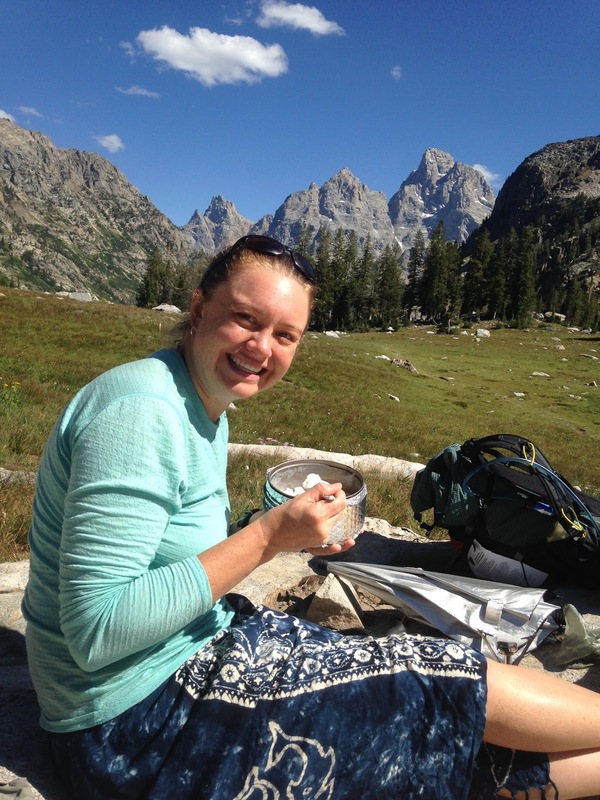 While Laurie went for a swim, I made her mac n cheese – her favorite backpacking meal. For added nutrition, we added dehydrated veggies. We also spread our Tarptent and ground sheet out to dry under the hot sun. After an hour or so, we packed up and were ready to go. But we weren’t getting far because we kept stopping and taking photos of the majestic Tetons. 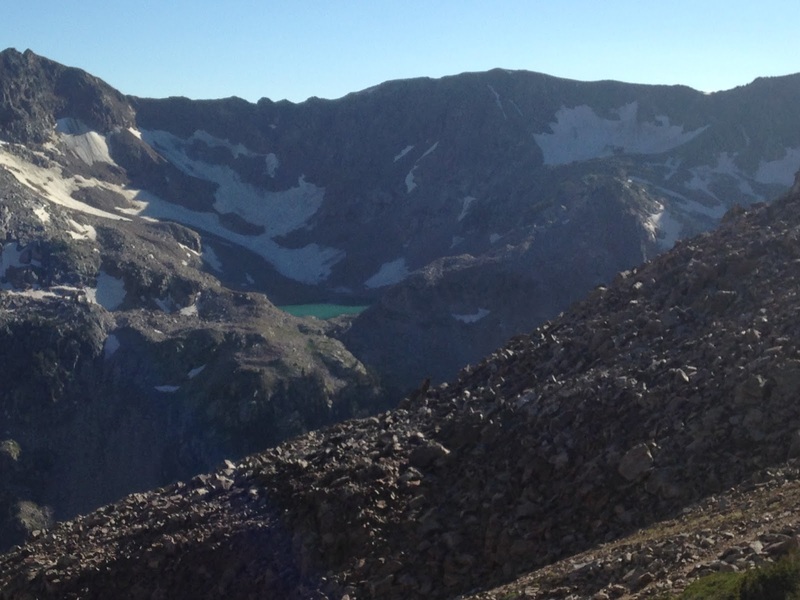 We continued climbing and noticed a lake above Lake Solitude. It was stunning. The water was bright green and it sat in a bowl surrounded by glaciers. 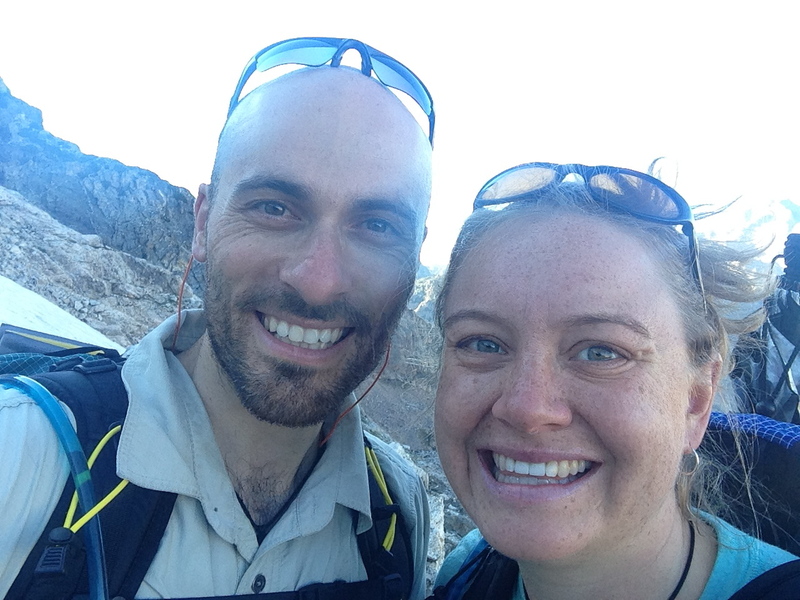 We couldn’t help but smile as we huffed and puffed up the trail. We were loving this hike. The pikas were calling out, there was a slight breeze in the air and the sky remained a perfect blue. And the views were intoxicating. After a few long switchbacks we made it to Paintbrush Divide at 10,700 feet. Or so we thought. It was a false summit. There was more climbing to be had but we still had plenty of daylight and were fueled by outrageously beautiful scenery. We saw only two hikers heading in the opposite direction as we climbed. It was late in the afternoon and most people had probably made camp at the designated Upper Paintbrush or Holly Lake camping areas. Secretly I was worried that Holly Lake – our destination for the night – would be filled with hikers, but I didn’t voice this to Laurie. We had to concentrate to get down from the Divide first. The descent was sketchy due to parts of the trail being washed out by rock slides. It was a very steep and exposed downhill back into the trees and meandering streams. As we passed backpackers scattered all over the Upper Paintbrush camping zone, my fears of Holly Lake being full worsened. Much to my surprise however, once we reached Holly Lake, there were no people to be found. We had the place to ourselves! 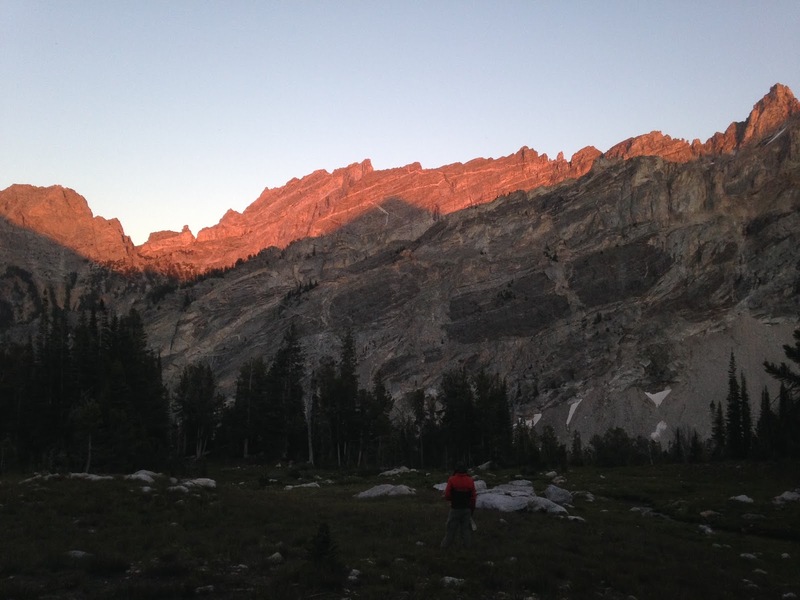 We chose a campsite with great views of the alpenglow, ate dinner, and went to bed. 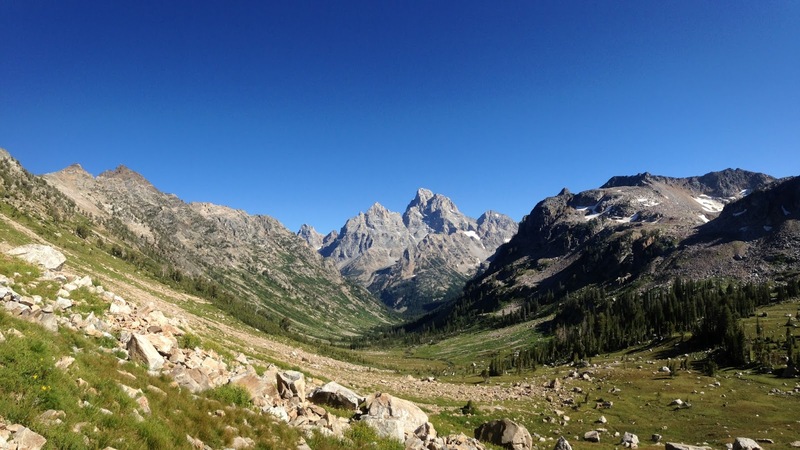 Another magnificent day in the Tetons. The next morning, we were up early once again to tackle the 6 mile downhill stretch of trail from Holly Lake to the String Lake parking lot. The views are less spectacular in this section. Oh how spoiled we’ve become by great views. Near String Lake, we saw a doe with her two fawns on the trail. One of the fawns was very jumpy and nervous. It would get close to us, then scurry off down the trail. As we approached, it would investigate, then take off in the opposite direction once more. I was worried that her behavior would lead the doe to protect it from us, but it couldn’t be bothered. 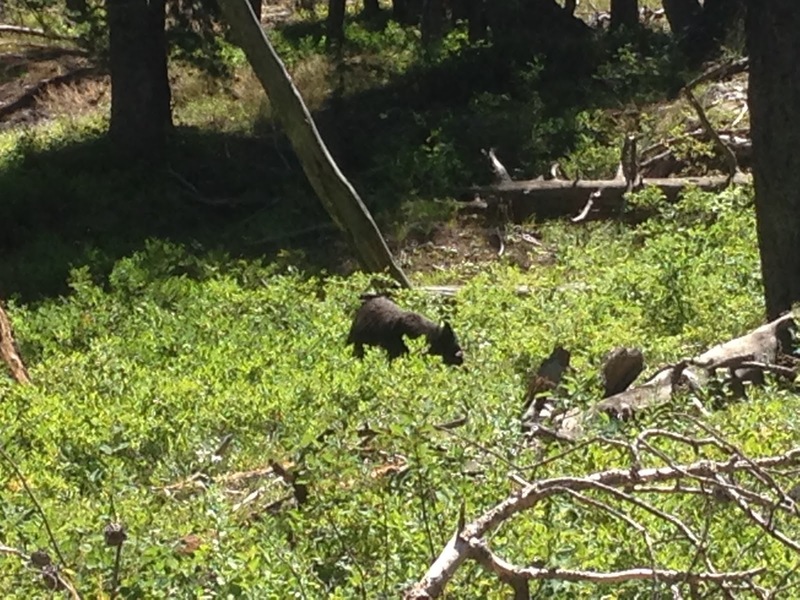 Other hikers also told us of a black bear and her cub down the trail but we did not see them. Once back at the car, we changed into our cotton clothes and played tourists in the Park before leaving for Colorado. Goodbye Tetons. Thanks for the memories. 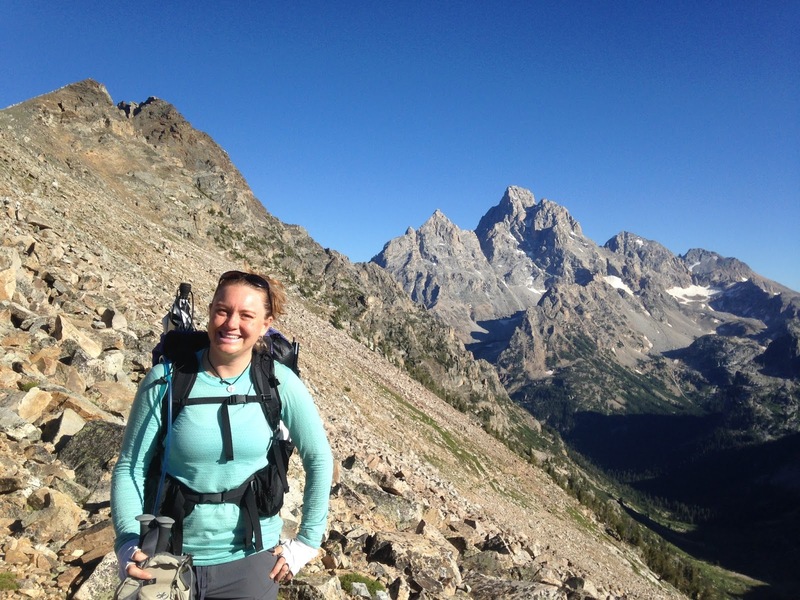 Laurie and I agree that while the climb is a lot steeper out of Paintbrush Canyon, we would prefer to do this loop counterclockwise to enjoy the views of the Tetons on the descent from Paintbrush Divide and through Cascade Canyon. 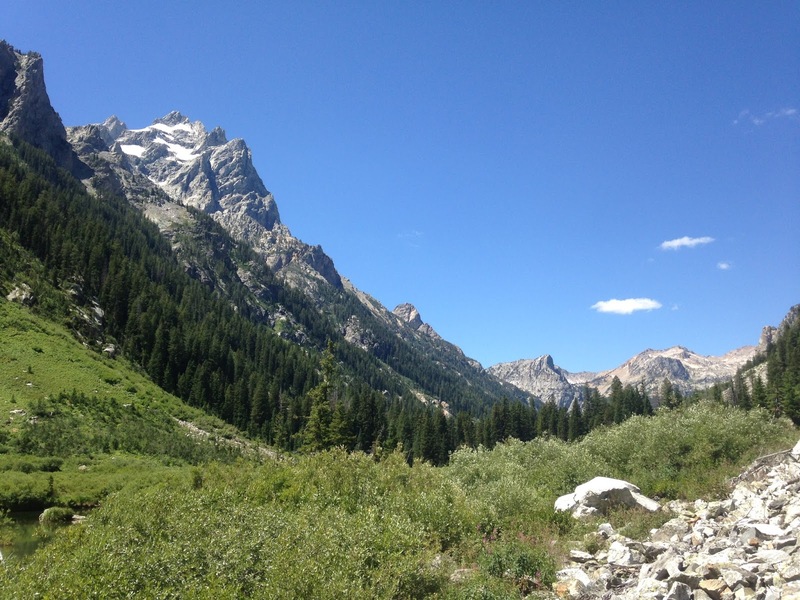 Camping at North Fork Cascade Canyon would be a spectacular place to watch the alpenglow on the Tetons as well.